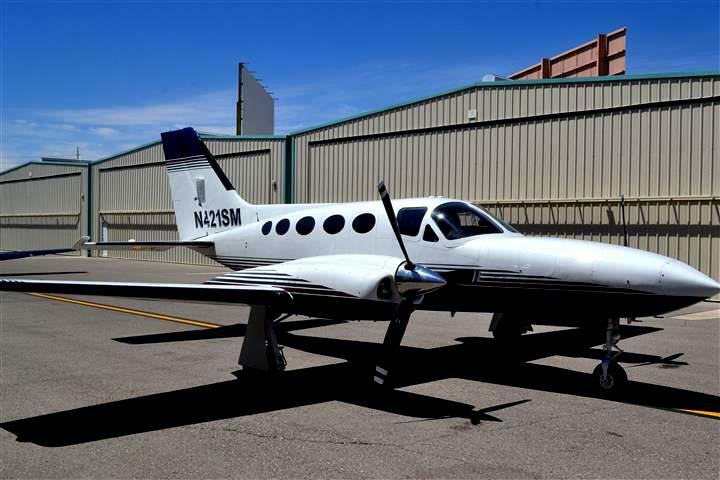 This spectacular 1982 Cessna 421C is truly one of a kind! With excellent paint and interior, a dazzling instrument panel featuring the absolute latest in Garmin equipment, pressurization, air conditioning and exceptional maintenance history, this aircraft is ready to take you wherever you need to go, in style! Place your logo on the tail. The unique "logo lights" on each horizontal stabilizer will light it up, creating a prestigious presentation for your corporate brand! NARRATIVE: THE AIRCRFT DEPARTED RUNWAY 15 AT THE CRESCO, IOWA, AIRPORT. THE PILOT STATED THAT THE WEATHER WAS FOGGY AND HE WAS ABLE TO SEE THREE OR FOUR RUNWAY LIGHTS ON TAKEOFF. AIRCRAFT SYSTEMS CHECKED OK BEFORE TAKEOFF, ALL DEICING EQUIPMENT WAS ON WITH A NORMAL TAKEOFF. PILOT SAID AFTER TAKEOFF AND WITH POSITIVE RATE OF CLIMB HE RETRACTED THE LANDING GEAR. AIRSPEED WAS AT 105 KTS., PILOT STARTED RIGHT TURN ON COURSE. AIRCRAFT RIGHT PROP STRUCK GROUND FIRST WITH LEFT PROP AND FUSELAGE NEXT, TRAVELING .2 OF A MILE ON A SNOW COVERED FIELD. ^PRIVACY DATA OMITTED^ THE STATIC SYSTEM, AIRSPEED INDICATOR, AND FLIGHT DIRECTOR WERE CHECKED FOR SYSTEM FAILURE. ALL SYSTEMS CHECKED WITHIN NORMAL LIMITS.